The Portal Key – 2518 image captures to make this one surreal image. The Portal Key- 2158 captures to create this one surreal image. Stacking of macro shots allowed for extreme depth of field. 2518 image captures using a Phase One 645DF+ with an IQ260 60 mp digital Back to create this single image. Setting out to create this scene of two boys on a serious adventure turned out to be itself a serious adventure. Macro photography is a whole other world of challenges and “The Portal Key” with its otherworldly concept wasn’t small on logistical challenges and problems to solve. Overcoming the extreme shallow depth of field of shooting macro and keeping a consistent lighting that is to scale were two of the issues that made this project very interesting to work on. The basic concept was two boys using a portal key to transport themselves form one crazy adventure to the next. 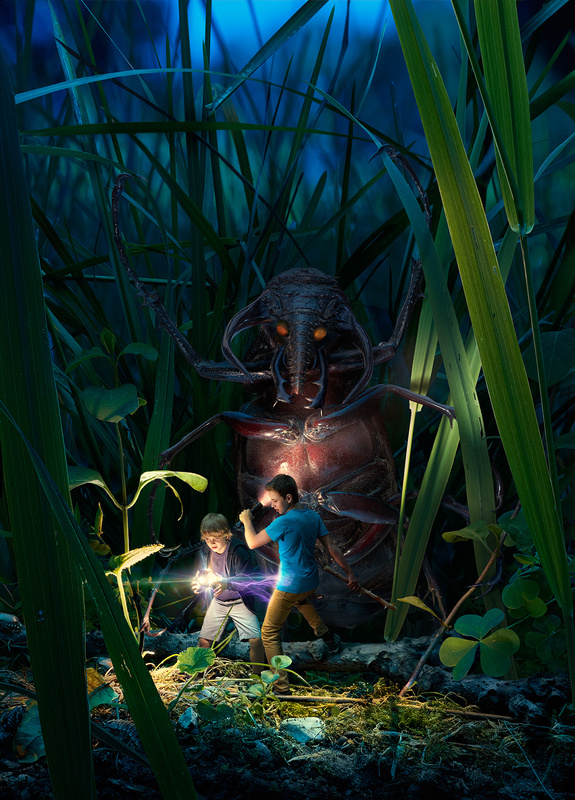 In this scenario they found themselves scaled down to bug size deep in the grass, desperately trying to fire up the portal key to transport themselves out of imminent danger. Planning this image took some careful consideration since many of the elements had to be photographed separately yet had to have the light fall on them in such a way to be consistent when all the elements were brought together. The lighting had to be to scale since the two main light sources were the flashlight and the portal key which where comparably extremely small. The overall fill was a cool soft light meant to be the dusk sky. To light the small plants I used a Hensel Star Spot with the fibre optic attachment. I used both the 10mm and 5 mm optic cables. The sky fill was a Hensel 30cm by 50 cm Flashbox over a large diffusion screen. I ended up hitting the scene with a bit of direct fill with a matching cool gel just to give that omni directional fill that you get out doors. Lights were powered by Hensel Nova D 2400 packs. The fill was a self contained Hensel Speedmax. The Speedmax is a super fast flash with durations down to 1/66600 of a second. (That isn’t a typo ). Not exactly the normal flash for fill but it was handy and it is a strobe that is designed to flash repeatedly for a very long time so it doesn’t hurt to use it and save my regular flash tubes. I shot at f18 but still required 50-60 even 70+ shots for some elements. The bug was photographed in sections. The bug in the shot doesn’t exist as you see it. I wanted it longer and more legs. I also wanted it to look like it was rearing up and bending in the middle. To do this I had to photograph each section at the angle I needed; Then shoot the whole range of slices, move the bug and start all over again. Each leg had to be shot separately this way as well and I had to imagine where the leg would be in the photo and adjust the light each time to match it. Doing a rough assembly in my working file allowed me to see if what I was shooting was going to work. I could then go back on the set and tweak the subject and start the process again. 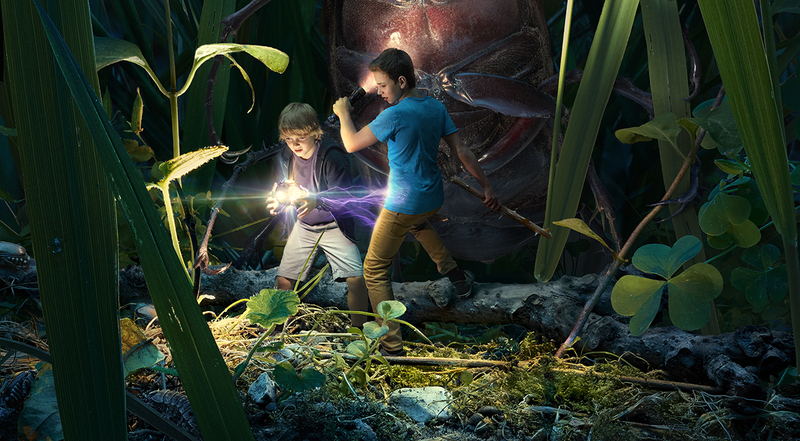 Detail showing the Portal key and the two adventurers merged into the macro world. Stacking the photographs was done in the application called Zerene Stacker. It lines up the photographs and merges the sharp portions. Pretty amazing what it can do. I was able to retouch right in Zerene to clone from any of the original file layers to the final stacked image. This helped remove any glitches that occurred during the stacking process. It does a great job but it can’t invent information that isn’t there. When the camera moves through the scene it can cause some areas to be “lost” by out of focus elements in the foreground. Zerene makes a best guess but inevitably there are a few bits that need some special attention. When I went to light the boys I needed to create the same lighting feel. I bounced a couple of EH Mini heads into the white ceiling with the cool gel for the overall fill. A reflector helped fill in the shadows a touch. I used the star spot with the finer optic cables to give a hit on the older boys hair as if it was catching a bit of light from the flashlight. The fibre optics allowed me to get in closer and not get any spill on his arm. The key light was a Hensel Light Stick which is a small powerful strobe that can be mounted in tight spaces. It gives an omni directional coverage which was perfect to emulate the Portal key. I photographed the Portal Key Device separately and added it in where the light was positioned. The electrical sparks were added from a previous photo-shoot of a 3 million volt Tesla coil. Detail showing the bug. Each part of the insect was photographed separately in “slices” using a computer controlled rail and stacked in a stacking program. High technical skills ! Such an image would make my computer explode. I am curious about the kind of computer which could handle such a file. If I work a 500 mb image in Photoshop, I have to restart each 2 hours. Yes there was no shortage of processing power. I was using a new fully maxed out 12 core macpro. It is screaming fast.